We are currently developing an educational program to help young people build the critical, reflective, and creative thinking skills and emotional awareness they will need to address complex and interconnected issues as citizens and future leaders. The program consists of a series of modular courses that cover overlapping and interconnected themes. These flexible courses can be made available in several formats, including online self-teaching guides, teacher syllabi and student manuals, or published handbooks. They are also being designed to be adapted to multiple cultures and communities. We are compiling exercises from various successful methodologies, including formats for enhancing social and emotional intelligence, media literacy, critical thinking, group collaboration and communication, theater and self-expression, violence prevention, and conflict resolution. We are combining techniques from these diverse sources, as well as scientific research about how children learn and grow, into a practical and innovative methodology to be tested by teachers and facilitators. Our main goals are to help students develop cognitive-emotional skills and capacities that may empower young people to create healthier societies. 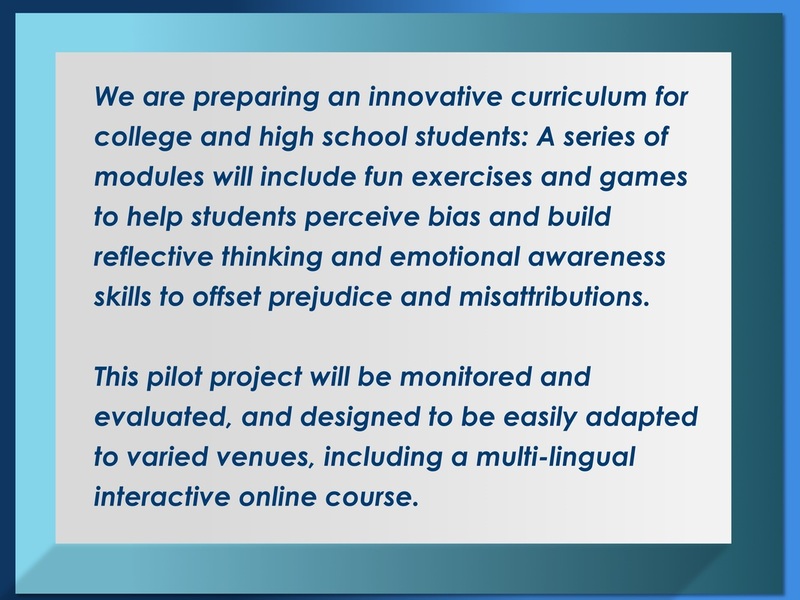 Using hands-on psychological experiments and innovative games and software, students can be guided into the rich realm of the human mind: to learn how the brain filters and selects ideas from vast amounts of stimuli to create stories to explain reality; how implicit bias and unconscious motivations may color our perceptions; and how groups influence individual behavior. Students will have opportunities to better understand the working of their own minds and learn how mental models are formed and changed by marketing, exposure to imagery and words, and how perceptual impairments, self-deception and blind spots may limit reasoning and decision-making. Learning how brains respond to media images and tag meaning sheds light on how our opinions are formed at a deeper, mostly unconscious level, and then demonstrates how our minds find or manufacture logical rationalizations to explain our decisions and preferences. By presenting an interdisciplinary synthesis of related knowledge, we can show how early trauma and hate training on an individual and family level are linked to acts of collective violence on a societal level. Any situation that strips away dignity and makes a person feel helpless offsets healthy neurodevelopment—and contributes to diminished capacities, rigid thinking, and vulnerability to political manipulation and extremism. There can be no long-term abatement to war, tyranny, terrorism or bigotry if fundamental inequities are not addressed. In particular, torture, oppression, the inequality of women and child abuse. Bias and prejudice can never be completely eliminated, but we can learn to recognize them in ourselves, and others. Bigotry can be offset by helping children develop social, emotional and cognitive skills, and by exposing them to other cultures.